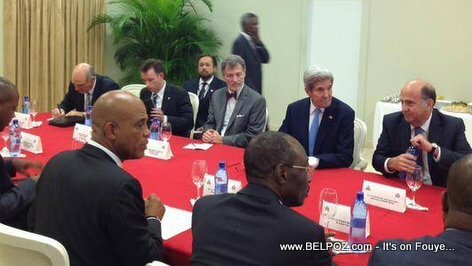 PHOTO: Haiti - US Secretary of State KERRY in a Meeting with President Martelly, PM Paul et al. Look at this photo... Haiti - US Secretary of State John KERRY is in meeting with President Michel Martelly, Prime Minister Evans Paul, New US Ambassador to Haiti Peter Mulrean, Former US ambassador to Haiti an Kenneth H. Merten, Special Coordinator for Haiti at the State Department. A la tayo wo ! A la tayo graté wo !